Welcome to Wow! Can y'all believe it is officially summer now? Funny the last two weeks when our air didn't work we had the hottest weather and now we have been enjoying cooler lower humidity after getting the air fixed. Yes, it is fixed!!! It's been so nice out again that I'm cooking out as much as possible before the heat hits again and I know it will soon. Let's ring in summer looking at some features from last week! 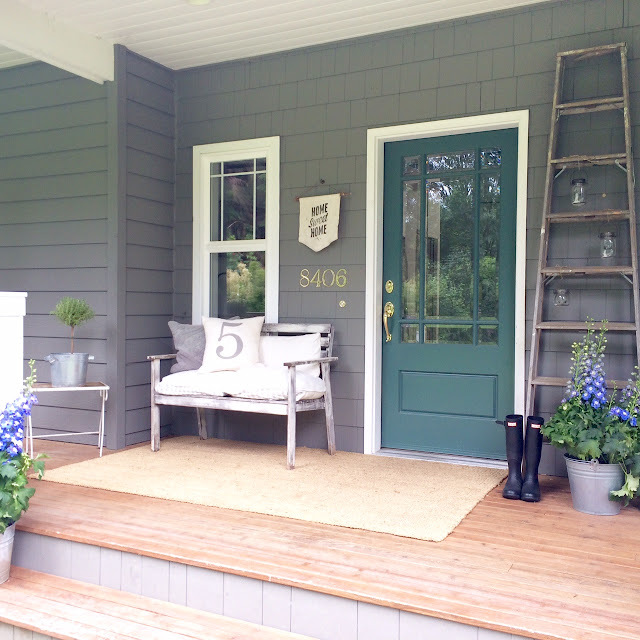 Julie from Little Farmstead shares her cute summer ready porch. I love these cute buoys made by Scavenger Chic. Vintage Refined does a great job transforming these factory carts into coffee tables. When I saw this Mocha Protein Smoothie I wanted to whip one up, but I didn't have all the ingredients on hand. I'm going to get them so I can enjoy one. Thanks to everyone for partying here! Thanks for the party! Hopefully you gets some relief from that heat. Thanks for hosting Kim! Glad to hear your A/C is working again! Thanks for the party, Kim! Happy summer! Great features this week! Thanks for hosting and have a great week Kim! Hi Kim, Thanks for featuring my factory cart coffee table this week! Kim, happy summer! Thanks for hosting us. Thanks so much for hosting, Kim. Enjoy your "cooler" weather. We've had the exact same scenario the past 2 weeks. Our air has been acting up but my hubs has been able to fix it both times. Thankfully. Thanks for hosting! You picked some lovely features! Happy Summer (I'm glad your air is fixed...we don't have air conditioning in Seattle!! And it still gets hot!). Our summer began with rain and a thunderstorm. See you next week! Thanks for the opportunity to party at your place, Kim! Hope your nice weather holds out! Thank you Kim for hosting! Hope your week is great! Great ideas here! Thanks for sharing and hosting!